The Graduate Management Admission Test, or GMAT Exam, is the most widely accepted standardized test for business school admissions. The exam is administered by the Graduate Management Admission Council and accepted by more than 6,100 graduate business programs across the globe, more than any other test. If you are preparing to enter an MBA program in your metro, you may have to study for, and take, the GMAT. The GMAT Exam consists of four sections that test your competency in core business-related skills: verbal, quantitative, analytical writing and integrated reasoning. A distinguishing feature of the three-and-a-half hour exam is that it’s a computer adaptive test (CAT), meaning that the level of difficulty for each question fluctuates based on your responses. While overall scores range from 200 to 800, two-thirds of test-takers score between 400 and 600. 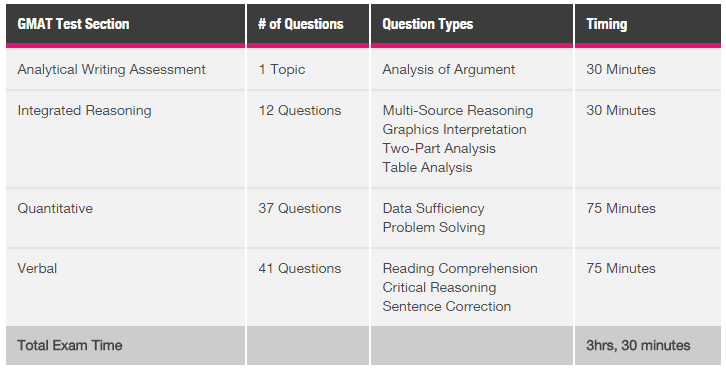 However, as the analytical writing and integrated reasoning sections are scored separately, your overall 200 to 800 score is determined solely by your performance on the verbal and quantitative sections. A little fuzzy on parallel construction or the finer points integration? You might need a refresher. Scoring well on the GMAT Exam requires preparation. See below for analysis completed by the makers of the exam on the correlation between preparation time and exam scores. There are ample resources available in print and online to get you started. In fact, some business schools offer study courses at reduced rates to prospective applicants. 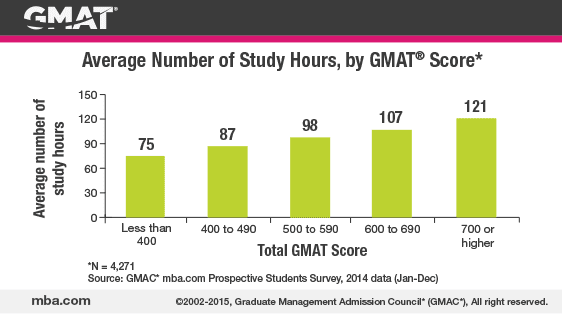 Click here to view The Official Guide to Your Best GMAT Exam. Many of the MBA programs in your metro will require you to submit GMAT scores in order to apply. Alternatively, many schools will accept the Graduate Record Examination, or GRE, in lieu of the GMAT Exam. However, there are some MBA programs that do not require the GMAT Exam or the GRE, and some that allow applicants to waive the exams if they possess certain undergraduate GPAs or years of professional experience. MetroMBA makes it easy to research your target schools in order to determine whether or not you need to take the GMAT Exam or the GRE. Click here to find out which MBA programs in your metro don’t require the GMAT Exam or the GRE.